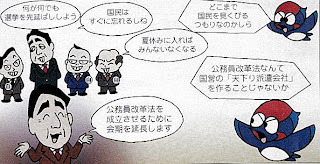 The DPJ has issued another campaign flier featuring a comic strip that tells the story of how the Abe government learned of disappearing pension payments in December 2006 and covered it up until questioned by DPJ Diet members in May. This panel asks, "For what purpose is the election postponed?" In the foreground, Abe says, "The Diet session was extended in order to pass the administrative reform bill," to which the DPJ bluebird replies, "What administrative reform law! Didn't you just make a state-managed 'amakudari temporary staffing company [haken kaisha]?" In the background, meanwhile, Abe and his cackling LDP cronies talk about the real reasons for delaying the elections: "Let's delay the election by all means. The people will soon forget." "If we make it in summer," says his advisor, "no one will be here." The bluebird replies, "I wonder to what extent they look down upon the people." This is actually similar to a suggestion I made a month ago: the DPJ should make "a video compilation of all of Abe's apologies for gross mistakes made by his government, with a cameo or two from Ministers Yanagisawa, Kyuma, Aso, and, of course, Mr. Nakagawa." 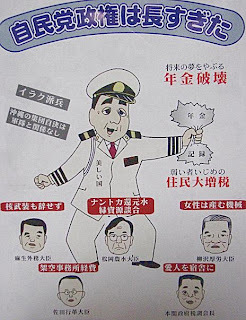 While this flier is considerably less effective than a video that would let Abe and his ministers speak for themselves, the idea is the same. Time and time again, the government has given the opposition ammunition for its campaign. It's about time they put it to good use, although, that said, it is unclear how exactly voters will respond to this. Will it be enough to make them put off their vacation, or else submit an absentee ballot to register their disgust with the generalissimo's government? A terminolgy question: the poster calls the tax that has been raised the jūminzei, not the shiminzei. Also, are the cartoons a local product or a national one? The layout, print quality and artwork are terrible. Having Matsuoka's head covering up the Prime Minister's crotch is embarrassing, if not obscene. And it's not a local product — it's evidently to be distributed nationwide. As for the quality, Ozawa's doodles at a meeting? For a country known worldwide for its cartoons, the production quality is indeed embarrassing.